This is a Mathematics app that helps young children gain a better understanding of positional concepts in the English language. Due to the fact that the app focusses on 'position', this is where the Mathematics aspect comes from, however, there is also a literacy element to the app as it introduces the user to a number of words as they work through the app. Depending on the user’s desire either the Mathematics or literacy aspects can be seen as secondary to the other however I would suggest this would work better as a Mathematics app. 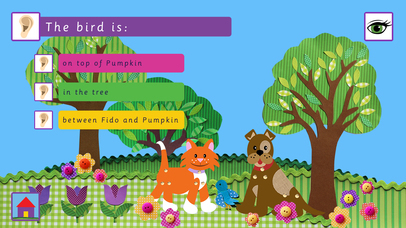 Fido&Pumpkin Position Words' supports the: Australian Curriculum Mathematics Content Description for Position, the UK National Curriculum Mathematics Geometry- position and direction, Year 1 and the US Mathematics Common Core State Standards for Kindy. From looking at the fidoandpumpkin.com website it is clear to see through the blog and the team profiles that there is a lot of passion and knowledge about teaching, learning and especially the curriculum for learning. Users can also find via the website more resources further showing how able the team is in producing resources to enhance the learning of young children. I like this app for a number of reasons but mainly because it can actually be used in a number of different ways. For instance, at first glance it is an app that helps young children, who already have ability in reading to further deepen their knowledge and understanding of positional words in the English language for instance, over, under, behind etc. A user who can read comfortably can access this app, play the challenges and learn as they go on. However, this app could also be used with a younger child. A child that maybe doesn’t know how to read or cannot read as proficiently as the app would require for solo use. 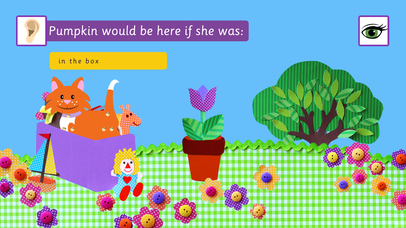 The user, working with an adult could still access the content and could still learn a lot about positional words. The app therefore, maybe without trying, provides two slightly different types of learning about the same content. For me this ‘added’ learning provides good value for money as users can use it in a couple of different ways to maximise their investment in the app. It can also be used as an app to develop mathematical understandings which ties in with the English and Australian curriculums. As users learn the correct words they are also able to learn the concepts within the app. Outside of this there are a number of other really good features to talk about in the app. Firstly, the design is incredibly clean and well-pitched at the age of the user that will be accessing the app. The illustrations are extremely well crafted, similar to something out of an award-winning picture book and this helps to keep the user engaged in the app and wanting to come back. In a children’s app there is nothing worse than the content being fantastic but the user being put off from accessing it because a lack of effort and time has been spent on making the app look appealing. The ease of gameplay is also another big bonus for me. At the beginning of the app there is a very short explanation of how to access and play the app and this is all that is needed. There are no fancy bells and whistles to confuse the user just a simple gameplay well described. The content of the app itself is another big selling point, although because it is so good I was left wanting more. However, with engaging characters, like Fido and Pumpkin I can see that there is a lot of scope for a whole series of apps focusing on different aspects of learning to read or any other type of learning for this age range. 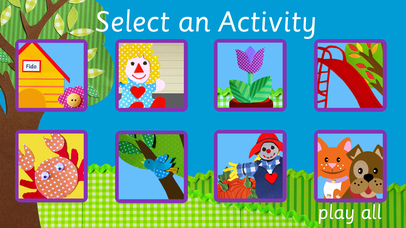 Once in the app the user has the option to select different scenarios for Fido and Pumpkin. There is an introduction in each one with the beginning of a sentence or a question; such as ‘Where is Fido?’ and then a list of three positional options. The user can choose to have each option read out to help make the correct selection or to read it themselves. If they make the wrong choice, instead of just being told it is the wrong, the app shows where the character would be positioned if the answer was correct. This is an excellent feature as it not only allows immediate feedback but also shows the user what the answer they gave actually means, therefore expanding their knowledge. Once the user gets it correct they then move onto the next scenario. Overall, this is a well-constructed app; from its design to its gameplay. It can be used in a number of different ways and being linked well to the curriculum it could be used in both the classroom and at home.